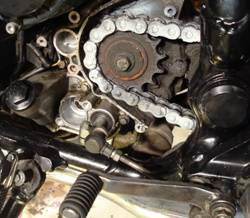 I’ve had considerable shifting trouble with my 1997 Honda Nighthawk, primarily from first to second gear. When it warmed up the gears would grind as if they couldn’t mesh properly. The only way to get a smooth shift was to wait between first and second until the gears had slowed enough to make a reasonably smooth shift. Having searched the net for a solution I came across the Factory Pro shift kit and thought “What have I got to lose?” Well, this turned out to be the answer to my problems. What follows is a description of the installation procedure and the problems I encountered. To begin with the procedure is very straightforward and does not entail any major removal of parts. Having said that I must warn you that this installation is not for people with little or no mechanical experience. 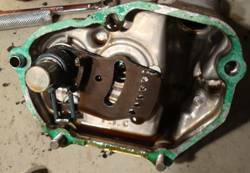 Before you start make sure the transmission is in neutral and on the center stand. 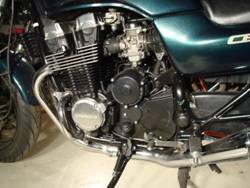 (ed: In general, older bikes must be in neutral to line up pawls, gear teeth in the shift mechanism. Newer design transmissions. like designed in the mid 90's or later, don't have to be in neutral). Remove the shift arm's 6mm bolt completely and use a tap a screwdriver in the clamp's slot to spread clamp. There is a small dot on the shaft and the clamp that align when you replace the arm. There six screws with allen wrench (umbraco) heads. It takes a little fiddling but you can maneuver the cover off the by twisting and turning. You might as well take off the side stand switch right away because it will just be in your way throughout the procedure. The next step is to remove the cover itself. There are five bolts where one of them has a copper washer. It’s important to note the placement of that bolt. The two bolts at the bottom are very difficult to reach and require an offset boxed end 8 mm wrench. Buy this before you start! You may as well take out the two screws on the heat shield and loosen the middle screw to get a little more room. The middle screw won’t come out due to clearance. Be aware that the lower two bolts on the case can only be removed with the cover as it’s being maneuvered off. After the bolts are removed the cover may be hesitant to come loose. I had to use the shaft of my hammer to tap it loose. 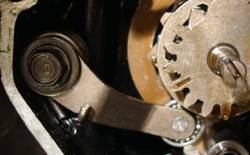 When removing the cover remember to pull the shifting shaft out at the same time and release it from the gear assembly. Notice the hole in the middle of the shifting assembly. It will be used when reassembling to line up the gears. The corresponding lineup hole is behind the neutral switch. Here you see the cover plate that holds the shifting assembly in place. Remove the two bolts and carefully slide the plate out. To the right you see the hole for the shaft assembly removed earlier. 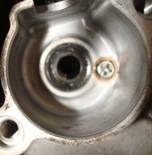 Remove the two cover plate dowel pin guides to ensure that they don’t fall into the oil return hole. 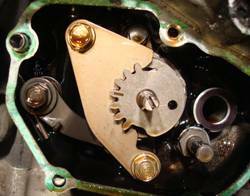 Now we come to the root of the problem with the early Honda transmissions. (finally!) The detent arm and the spring is what must be changed. Here you have to be VERY CAREFUL! 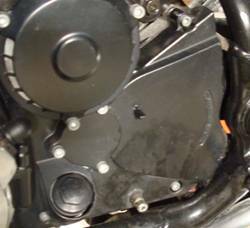 Behind the arm is an oil return hole large enough to lose objects into the sump. Start by placing the end of a rag into the hole. Now assemble the arm, collar, spring and washers and install it in place. Everything will be loosely in place while you start the threads of the bolt. Be sure the spring is correctly mounted to the arm and tighten the assembly just enough to bring everything together. Snip the zip strap and snake it out from behind the spring. Now begin to tighten down the bolt as you work the arm with a large screwdriver. This is important! If you don’t work the arm the collar won’t seat properly and you will get a false feedback which may cause the whole thing to loosen later as you’re driving. You will see and feel when the washer centers on the collar. Actuate the arm to check that it is functioning as it supposed to. Here the new arm is in place. Now carefully replace the cover plate for the shifting gear. Remove this and insert a long thin Phillips or a long scribe and make sure it goes through the lineup hole in the shifter assembly. Be sure the thrust washer is placed on the shaft. 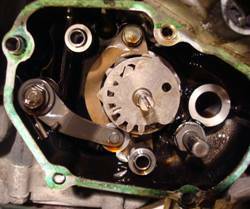 Before you begin the reinstallation of the cover and shifting arm be absolutely sure the shifting gear is pointed directly forward. Otherwise you may not be able to shift gears. Remember! The transmission must be in neutral during the whole procedure! When you believe the cover is in place you should be able to push it up to the point where you can feel a small gap between the engine and the cover. The spring in the shifting arm will push it a little away but there should not be a large gap. DO NOT try to force it into place by tightening the bolts. This is incorrect! It should fall into place. Proceed after tightening the bolts evenly. When you’re satisfied that every gear is there then you can continue with the neutral switch installation. The switch has a line up mark on the rubber gasket for the center arm. 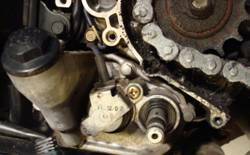 Reinstall the chain cover. As I mentioned earlier this kit solved my shifting problems. As long as everything else is in order I’m sure you find a greatly improved performance on your bike also. These instructions may seem unnecessarily long but I have tried to include as much information as possible to make the job easier for those who don’t have a great deal of experience with a wench. Remember! Use common sense! If the bolt won’t come out or the assembly won’t go in, don’t force it. Find out why and have alternatives ready. And watch that oil return hole.